One of the most dramatic days in the struggle for the State of Israel's character reached its peak Thursday evening: Dozens of parents to haredi school girls reported to the Jerusalem police after refusing to adhere to a High Court ruling on their daughters' education. The parents arrived amid great commotion, with tens of thousands of haredim accompanying them to the police compound; 32 parents were sent to Maasiyahu prison where they will be serving their two-week sentence. Dozens of protestors arrived at the prison as well, as large Prison Service, Border Guard, and riot police forces received the buses transporting the fathers to jail. Some of them arrived with young children, who were removed from the premises in cooperation with the protestors. However, 22 mothers and four fathers who were supposed to show up at the police situation did not arrive, authorities said. Police forces will now be searching for the no-shows in order to imprison them as well. Sources within the haredi community where the parents come from said that "something was screwed up." "The original plan was for the mothers to enter prison without incident. They already underwent mental preparation," one source said. However, a senior haredi source said the mothers headed to the homes of various haredim "and have no intention of turning themselves in. If the police wish to, they can go ahead and take them. The women will not resist." The parents were ordered to report to the police station at 5 pm, but were delayed by the mayhem in the area, as an estimated 100,000 haredim accompanied them to the compound. A bus escoring the parents also transported some children sporting handcuffs as a form of protest. An elderly haredi protestor was hurt in the commotion at the police station and was evacuated by Magen David Adom paramedics. Many children at the site bid their parents farewell in tears. At least 20 school girls were standing at the police compound, crying and calling out for their mothers. The girls' fathers were hugging them and attempting to calm them down. The girls' school principle was also on hand to reassure them. Some of the girls were asking whether they too will be taken away on buses. Knesset Member Moshe Gafni said the situation was delusional: "Young girls are saying goodbye to their fathers, who did nothing wrong. It's a terrible sight befitting dark regimes in history, rather than a modern state." The Haredim are upset over a High Court ruling against the discrimination between Ashkenazi and Sephardic girls at the Beit Yaakov school in Emmanuel. Earlier Thursday, an estimated 110,000 haredim took party in rallies in Jerusalem and Bnei Brak to protest the court decision and imprisonment, in what organizers dubbed "the mother of all protests." 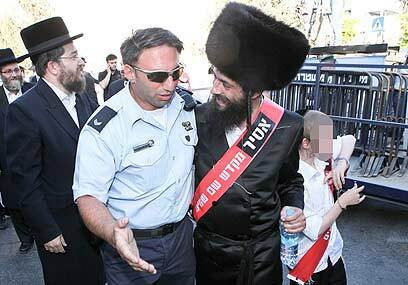 See all talkbacks "Police seeking haredi no-shows"